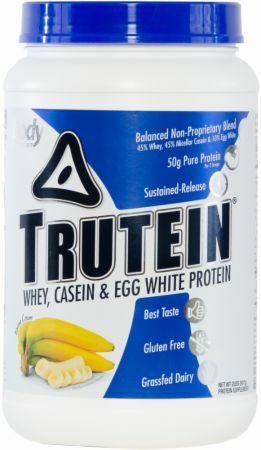 While other protein powders on the market contain whey, casein & egg white, Trutein is unique because we do not hide the protein proportions within a proprietary blend. There's a good reason why proprietary blends are so common in proteins: whey can be half the cost of the other types of proteins. Therefore, when you purchase product with a proprietary protein blend, you're most likely receiving 99% of the cheapest ingredients and 1% of the expensive ingredients. This defeats the whole purpose of using the triple-protein combination of whey, micellar casein and egg white for their sustained-release properties. At Body Nutrition, on the other hand, we understand that you 'the consumer' are the most important part of our business and we believe that you deserve to know exactly what you're buying. 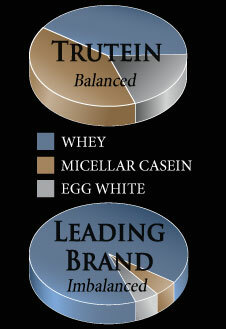 That's why we fully disclose Trutein's protein proportions and why we refuse to hide anything in a proprietary blend. One of the most important aspects of any protein is its taste. Most of us make a protein shake at least 2-3 times per day, 365 days per year, so it had better taste great. We're confident that Trutein is something you'll look forward to drinking and something that you'll enjoy with each sip. In fact, we've been told by many customers that they consider Trutein to be their reward at the end of their grueling workouts. Trutein predominantly uses the "isolate" forms of whey and micellar casein (from milk protein isolate) as opposed to the "concentrate" forms, which are less pure with more fat, lactose and cholesterol. Our proteins are also processed using a nonthermal, cross-flow nanofiltration system to give the cleanest possible product while retaining the naturally-occurring bioactive peptides, including alpha-lactalbumin and glycomacropeptides. Thank you for your interest in Trutein! We know you'll enjoy it as much as Body Nutrition enjoyed creating it! Don't let the bad reviews on birthday cake deter you. Earlier tubs I've had did have a chemical aftertaste, but the most recent tub I had tasted awesome, much like the One Bar by Oh Year. Salted Caramel is an amazing flavour, wish they carried it here. Lemon Meringue Pie is the best flavour of all. I will be the first to say that lemon meringue pie as a protein flavour sounds a little weird. Maybe because I typically stick to vanilla flavoured protein as I find its the most versatile to cook with, make smoothies with or simply just have in a shaker with water. Let me just say this flavour is AMAZING... blows any protein powder out of the water, I basically consider this a treat. Blends easily in a shaker with water, is awesome in smoothies, and I've even made protein pancakes out of it...all amazing. For reference I've tried smores, chocolate mint, chocolate, vanilla, birthday cake (imo awful), and chocolate peanut butter and all I would consider average minus birthday cake which I couldn't even finish. I like Trutein because its a blend, its grass fed dairy, it blends well and the price is very competitive. I've probably tried up to 20 different types of protein brands, three of which were blends similar (trutein, magnum and jym). Magnum vanilla will probably remain as my go to vanilla protein as a I prefer the nutrition and taste and texture of it compared to Trutein. The only reason why I strayed from it was because I was hoping to find a protein similar for a lower cost. Jym vanilla probably has the best vanilla flavour I've tried but the mix-ability in a shaker with water is painful. Overall this lemon meringue pie is a solid winner and will definitely become a part of my regular protein rotation! I bought sample sizes via Amazon, since they didn't offer them on BB. Of the flavors tested, 10 - Banana, Lemon Meringue, Cookies n Cream, Mocha, & Strawberries n Cream. And 7- Red Velvet, PB, Salted Caramel. Thought these flavors were a bit bland. But the powder itself blends well, hopefully in the future this brand will use sunflower lecithin as an emulsifier, instead of soy. Other powders are trying to change over. 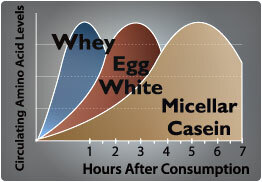 I tend to order Muscle Feast & Allmax b/c of this factor. Love the Trutein protein. This product mixes so creamy with just water. No clumps, I was looking for a protein that would help keep me fuller longer and its great. Chocolate Peanut Butter cup isn't very peanut buttery. S'mores is alright, but nothing special. My favourite is Mocha and Shamrock Shake (not sold here). Banana is great as well. Cant wait to try cinnamon bun and birthday cake. Trutein has been my most commonly utilized protein in an all-purpose capacity. It's great whether you use it for pre-workout, a quick and light breakfast in the morning, or during a break period at work. It mixed well using just a shaker cup and here is a tip; it tastes better in my opinion if you shake it up but then let it sit in the fridge for at least five minutes or more and then shake it again before enjoying. Speaking of taste the best flavor in my opinion is not listed here; I would be speaking of Cookies and Cream which is a 10/10; also Strawberries and Cream is a very respectable 8/10. Some flavors will come and go so try them while you are able to if interested. Overall the flavors are mostly satisfactory although some could be improved upon with a little reformulation, such as Banana Cream, which tastes too much like Banana Taffy rather than a more decadent Banana Cream Pie. Regardless of flavor preferences the product profile is excellent and batches are very consistent. Thought I would give it a try cause Jym got rid of good flavors, Maybe better than the old cookie crunch, Very Satisfied. Thank You for making a good protein.Looking forward to trying other flavors. I am a die hard Trutein fan. Love the flavor and mixes well. Besides it works for me. Its made more naturally than others with out all the processings. Its the cleanest protein I have found and have used it for quite awhile now. I'm 68yrs old and this is my go to protein. I have been using Trutein for over 2 years and chose it based on the lower calories, carbs, and sugars. It's important for me to add protein to my diet after a workout or as a meal replacement without consuming a ton of carbs and sugars. This is perfect and the there are so many great tasting flavors available too. There are two others that I've tried, but not for sale here and they are Cookies & Cream and the seasonal Shamrock Shake. They're fantastic! Because I've become conscious of my diet and monitor my intake I'm happy to have come across Trutein! 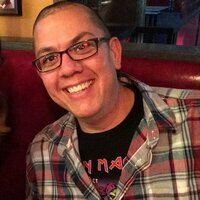 Over the last few years I've lost over 70lbs even though Trutein isn't a weight loss shake. Hands down this is the best blended protein I have found. Truth in labeling rates high on my priority list and Trutein is one of a handful of manufactures that discloses the protein blend. Equally as important to me is taste, and Trutein delivers. I've rated the flavors based on my own preferences to certain flavors so a lower rating doesn't mean anything was bad about the flavor. While I wasn't a huge fan of lemon, I still think it's worth a try for those of you who like a lemon flavor. Next on my list is how well their product mixes. There's nothing worse then getting dry protein clumps when your drinking. Trutein really does mix well with just a shaker. This is great because there is no need to break out and clean a blender every day and it's convenient to use at work. The final reason I've become a big fan is their diversity of flavors including seasonal favorites such as egg nog, shamrock shake, and pumpkin pie. I can switch up flavors every couple of weeks without getting bored. I've also started mixing my own - banana, cinnamon, and vanilla - it's like drinking banana bread! 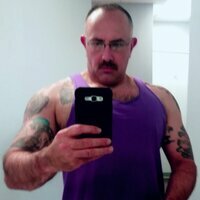 FYI - I truly am just a long time user (2+ yr) and used the product as part of a 135lb weight loss transformation. I rarely write reviews unless I find a product which is either exceptionally good or bad. I think you see where I stand on Trutein! Used so many this is the best blend I have found..started bodybuilding in 1986. 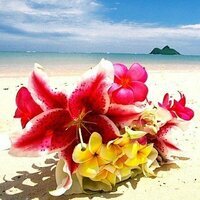 I'm recommending to my clients. Over the past 1.5 years I have been using Trutein in my shakes post workout. Depending on the competition season, I will also have a Trutein shake for my last meal of the day. This product has helped me to reach my protein intake goals, when there is only so many hours in a day. I recommend Trutein. I've been searching for a great mix of proteins! I ordered the chocolate peanut butter cup and although I wish it had more peanut butter flavor it is absolutely delicious and so smooth! It keeps you full for hours and the probiotic really helps with digestion. Since I've used this protein I haven't been bloated at all! Great product! I will definitely be restocking! I've tried so many protein powders over the years, and this is the only one I've ever immediately re-ordered because it is just that good. I'm someone who prefers to make my protein into a pudding consistency, and eat it rather than drink it; trutein is PERFECT for this, and the flavors I have tried are AMAZING! I'll definitely be giving more of them a shot. Great flavors, great tasting protein. You don't find many proteins like this. I would definitely recommend this protein to other! ** Percent Daily Values are not established. ALLERGEN WARNING: Contains Milk, Egg & Soy Ingredients. Mix 1 scoop Trutein with 8 ounces milk or cold water. Stir or shake for 15-20 seconds.